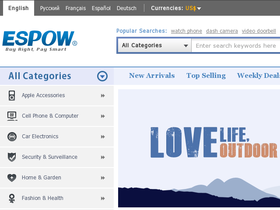 ESPOW, online at Espow.com, is your destination for consumer electronics. At ESPOW, you can find laptops, computer accessories, solar chargers, laptop batteries and batteries for camcorders and PDA's. There are also rearview mirrors, surveillance cameras, laser projecters, LED parking sensors, cell phone accessories, chargers, speakers, flip-down car DVDs, and camera kits on sale at ESPOW as well as stationery, outdoor products, home vacuum cleaners air purifiers, and gifts. RetailSteal.com has the best ESPOW coupon codes, ESPOW discounts, ESPOW coupons, and ESPOW promo codes. Shipping and handling rates at ESPOW depend on the pricing of your purchase and your shipping destination. See website for full details. Exclusions may apply. Use this exclusive coupon code online at ESPOW.com and enjoy a 5% discount on your entire order. Check out ESPOW.com and enjoy free shipping on select products. Click link to start shopping. For a limited time, save 10% on any iPad case when you use this coupon code at ESPOW.com. Click link to shop. Save 7% on select security and surveillance equipment from ESPOW with this coupon code. Shop now and save. At ESPOW.com, save 5% off on watch phones using this coupon code. Click link to shop and enjoy. At ESPOW, take up to 60% off auto electronics when you shop online. Click link for savings. Save up to 50% on Home Video Door Intercom Systems at ESPOW. Click link for savings. At ESPOW, save up to 50% plus receive free shipping when you buy iPad and iPhone Accessories. Click link to purchase. At ESPOW.com, buy a Solar Charger for 35% off. Click link to save. Save up to 30% at the laptop battery clearance happening now at ESPOW.com - click to shop and save. Get select watch phones for 30% off at ESPOW.com. Click link to buy. At ESPOW.com, enjoy a 25% discount on the iPad 2 Foldable Leather Case from ESPOW.com. Click to shop and save. Find gadgets for as low as $0.99 at ESPOW.com. Click link to shop online. Get the latest offers and deals in your inbox at ESPOW.com. Click link to save. Save 7% on facial products when you use our coupon code online at ESPOW today. Save $2 on purchases up to $20 when you use our coupon code online at ESPOW today.